As the temperatures begin to drop and the heat of summer seems to be behind us, the number of people participating in outdoor activities is on the rise. The same is true for distance running events. It seems that there is an event almost every weekend from now until the Crescent City Classic. If you are already a runner this is an exciting time of year. For those of you who have never been a runner, but would love to start, there is no time like the present. It can be intimidating to start a new activity, and running is no exception. The advantage running has over other forms of exercise is that it is a great cardio vascular activity and can be done almost anywhere with minimal investment. The following is a list of things you should know and resources to help you get started. Footwear: A key ingredient to running success is a good pair of shoes. The right shoes can be a very important component in the prevention of injury. I recommend buying your shoes from an establishment that deals with runners specifically. There are several reputable retailers in the Metairie and New Orleans area that can help you find the shoes that are best designed to accommodate your individual needs. A couple of my favorites are Varsity Sports and Louisiana Running Company. Have a plan: You have heard of the terrible twos? In the running world it is the terrible toos, referring to too much, too soon, and too often. If you have an established plan for your run / workout you are less likely to fall victim to this. You can find a great example of a training schedule for the novice runner here. Warm-up: Before beginning any exercise activity proper warm up is imperative. When preparing for a run, I recommend a more dynamic-type warm-up to static stretching. Cool Down: Cooling down and stretching after your run is as important as your warm-up, so be sure not to skimp on this. This is when you are more likely to benefit from static stretching. The muscle groups that tend to become the most tight with running are the gastrocnemius/soleus complex (the calves), the quadriceps, hip flexors and ITbands. You can find suggestions for stretching these and other muscle groups here. Listen to your body: Running is such an exhilarating form of exercise, it can be hard to stop once you get started. So be careful not to ignore the possible signs of injury. Pain that you feel during activity and pain that lingers after you have stopped that activity are indications that you may be in the beginning stages of injury. Give your body a break at this point. 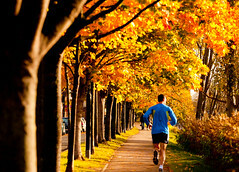 If after a few days of rest you are able to return to running pain free, gradually resume your prior running schedule. If the pain lingers and begins to affect you in your everyday activities it is appropriate to seek medical intervention. The staff at Baudry Therapy Center is always available to schedule a running consultation or to offer assistance with any other health or fitness questions you may have, just give us a call. Cheers to happy and healthy running this upcoming season!